Source of raw data and Advanced Level honours list; GCE Board’s Results Booklet. Full quantitative and qualitative analysis of results including performances in English and maths, quality of grades, ranking schools in each academic category, overall ranking of schools etc were all done by Fako UK/Fako News Centre. English is the language that defines the English-speaking Cameroonian. It has to be taught well, spoken well and written well. It is the medium through which English-speaking pupils and students are taught in schools hence it is the most important subject at the Ordinary Level. This year, 89,821 candidates sat the English exam at the ‘O-Levels’ and 77,911 failed (86.74 per cent failed). In mathematical ratios, this means that out of every 100 candidates who sat the English exam, roughly 87 failed. This is very shocking. Another embarrassing statistic is that only 4 candidates in the whole country had an A grade in English language; one from Sacred Heart College Bamenda, one from Our Lady of Lourdes Bamenda, one from PSS Mankon, Bamenda and one from GBHS Etoug-Ebe. The 77,911 candidates who failed English would have to re-sit GCE O-levels in the coming year(s) if they want to study beyond high school. This is because no matter how intelligent one is, passing English language is a prerequisite for gaining admission into all institutions of higher learning in English-speaking Cameroon and the rest of the English-speaking world. In mathematics, 86,724 candidates sat the exam and 78,568 failed (90.60 per cent failed). This is a disgrace. No wonder even though some students passed the O-levels overall, they still burst into tears because they failed English and/or maths. They and their parents knew straight away that they (students) would have to re-sit the GCE O-levels or else they would be stuck after their A-levels. At the Advanced Level, Christine Enowmbi Tambe of Saker Baptist College, Limbe, came 1st in the whole of Cameroon with 5A grades and having the highest average score within the grade ‘A’ boundaries in all her subjects, beating every other student who had 5A grades. The Cameroon GCE board mistakenly omitted the physics O-level results from the results booklet and so the O-levels honour list that was published was inaccurate. The board promised that the O-levels honour roll would be re-done. (ii)Quality;a) the average number of A grades achieved, and then expressed as a percentage of the highest grade ‘A’ average in Cameroon, which was achieved by Sacred Heart College Bamenda(3.78 A grades per student), b) the percentage of students who achieved an A grade in maths, c) the percentage of students who achieved an A grade in English. All the percentages from above are then added together to give a total score for O-levels. 2) A-levels. At the A-Levels, students specialise in what they are good at, so we use two measures only; overall percentage pass rate for Quantity and the percentage grade A average for Quality. Sacred Heart College Bamenda had the highest grade A average at the A-levels (0.9647). The two percentages above are then added together to give the total A-levels score. And then, the Overall ranking=points for O levels plus points for A levels. O-LEVELS; (a)Quantity:(i)all111 students passed, giving 100% pass rate, (ii) 106 out of the 111 students passed overall including both maths and English, giving 95.50%, 1st in Cameroon. (b) Quality: (i)the 111 students achieved a total of 397 A grades giving an average of 3.98 A grades per student,1st in Cameroon, giving 3.98/3.98 x 100 = 100% (ii) 68 out of 111 students had an A grade in maths, 61.26% of students, 1st in Cameroon, (iii) 1 student had an A grade in English, 0.9%. Total for ‘O’Levels = Quantity plus Quality =100+95.50+100+61.26+0.9=357.66 points. Sacred Heart College Bamenda came 1st at the ‘O’Levels. The highest points total; 1st in Cameroon overall. O-levels: Quantity; i) all 92 students passed, giving 100% (ii) 67 out of the 92 students passed overall including both maths and English, 72.83% of students, 2nd in Cameroon. Quality; i)the 92 students achieved 186 A grades, giving an average of 2.02 A grades per student, 2.02/3.78 x 100 = 53.44%, 3rd in Cameroon(ii) 29 A grades in maths,31.52% of students, 2nd in Cameroon (iii) 1 A grade in English(1.09% of students, 1st in Cameroon). Total for ‘O’levels= Quantity + Quality= 100+72.83+53.44+31.52+1.09=258.88, 2nd at the ‘O’ levels. A-levels; Quantity; all 103 students passed, 100% pass rate. Quality; the 103 students had a total of 69 A grades, giving an average of 0.6699 A grade per student, 0.6699/0.9647 x 100= 69.44%. Total for ‘A’levels= quantity + quality= 100+69.44=169.44, 5th in Cameroon at the A-levels. O-levels; Quantity: i) 112 out of 115 passed, 97.39% pass rate (ii)31 out of 115 passed overall including both maths and English, 26.96% of students. Quality: i)the 115 students had 267 A grades, giving an average of 2.32 A grades, 2.32/3.78 x 100= 61.38%, 2nd in Cameroon, (ii) 32 A grades in maths, 27.83% of students, (iii) No A grade in English, 0%. Total for O-levels= quantity + quality= 97.39+26.96+61.38+27.83+0=213.56, 3rd at the O- Levels. A-LEVELS: quantity; all 54 students passed, 100% pass rate. Quality; the 54 students had 50 A grades, giving an average of 0.9259 A grade, 0.9259/0.9647 x 100= 95.98%, 2nd in Cameroon. Total for ‘A’levels= quantity + quality= 100+95.98=195.98, 2nd at the A-levels. O-Levels: quantity; i)134 out of 135 students passed, 99.26% pass rate, (ii) 67 out of 135 passed overall including both maths and English, 49.63% of students. Quality; i) the 135 students of 205 A grades, giving an average of 1.52 A grades, 1.52/3.78 x 100= 40.21% ii) 16 A grades in maths, 11.85% of students, iii) 1 A grade in English, 0.74% of students. A-levels: quantity; all 113 students passed, 100%. Quality; 81 A grades, giving average of 0.7168, 0.7168/0.9647 x 100=74.30%. PSS Mankon, Bamenda, came 4th overall in Cameroon. O-level: quantity; i) 62 out of 66 passed, 93.94% pass rate, ii) 25 out of 66 students passed overall including both maths and English, 37.88% of students. Quality; i) the 66 students had 117 A grades, giving an average of 1.77 A grades, 1.77/3.78 x 100= 46.83%, (ii) 20 A grades in maths, 30.3% of students, 3rd in Cameroon, (iii) no A grade in English, 0% of students. Sacred Heart College, Douala came 5th overall in Cameroon. O-level: quantity; i)33 out of 35 passed, 94.29% pass rate, ii) 9 out of 35 students passed overall including both maths and English, 25.71% of students. Quality; i) total of 55 A grades, giving an average of 1.57 A grades, 1.57/3.78 x 100= 41.53%, ii) 5 A grades in maths, 14.29% of students, iii) no A grade in English, 0% of students. Total for O-level=quantity+quality =94.29+25.71+41.53+14.29.0=175.82 points, 12th at the O-level. OVERALL ranking= O level+A level=175.82+163.42=339.24, 6th . O-level: quantity; i) 32 out of 36 passed, 88.89% pass rate, ii) 11 out of 36 passed overall including both maths and English, 30.56% of students. Quality; i) 59 A grades total, giving average of 1.64 A grades, 1.64/3.78 x 100= 43.39%, ii) 6 A grades in maths, 16.67% of students, iii) no A grade in English, 0%. Total for A-level= 90+57.01=147.01 points, 10th at the A –levels. Amity International College Yaounde came 7th in Cameroon. O-LEVEL: quantity; i) 66 out of 68 passed, 97.06% pass rate, ii) 23 out of 68 passed overall including both maths and English, 33.82% of students. Quality; i) 70 A grades total, giving an average of 1.03 A grades, 1.03/3.78 x 100= 27.25%, ii) 6 A grades in maths, 8.82% of students, iii) no A grade in English, 0%. A-level: quantity; all 60 students passed, 100% pass rate. Quality; 33 A grades total, giving an average of 0.55 A grade, 0.55/0.9647 x 100= 57.01%. O-LEVEL: quantity;i) 97 out of 102 passed, 95.1% pass rate, ii) 36 out of 102 passed overall including both maths and English, 35.29% of students. Quality; i) 124 A grades total, giving an average of 1.22 A grades, 1.22/3.78 x 100=32.28%, ii) 12 A grades in maths, 11.76% of students, iii) no A grade in English, 0%. O-LEVEL: quantity; i) all 72 students passed, 100% pass rate, ii) 36 out of 72 students passed overall including both maths and English, 50% of students, 3rd in Cameroon. Quality; i) 79 A grades total, giving an average of 1.097 A grades per student, 1.097/3.78 x 100= 29.02%, ii) 6 A grades in maths, 8.33% of students, iii) no A grade in English, 0%. Total for O-level=quantity + quality= 100+50+29.02+8.33+0=187.35, 9th at the O-levels. Sasse College came 10th overall in Cameroon. O-LEVEL: quantity; i) 73 out of 76 passed, 96.05% pass rate, ii) 36 out of 76 passed overall including both maths and English, 47.37% of students, 5th in Cameroon. Quality; i) 95 A grades total, average of 1.25 A grades, 1.25/3.78 x 100= 33.07%, ii) 14 A grades in maths, 18.42% of students, iii) no A grade in English, 0%. A-LEVEL: quantity; 85 out of 87 passed, 97.7% pass rate. Quality; 22 A grades total, giving an average of 0.2529 A grade, 0.2529/0.9647 x 100= 26.22%. St Albert College Bafut came 11th overall in Cameroon. O-LEVEL: quantity; i) 18 out of 20 passed, 90% pass rate, ii) 9 out of 20 passed overall including both maths and English, 45% of students. Quality; i) 38 A grades total, giving an average of 1.9 A grade per student, 1.9/3.78 x 100=50.26%, 4th in Cameroon, ii) 2 A grades in maths, 10% of students, iii) no A grade in English, 0%. O-LEVEL: quantity; i) 52 out of 59 passed, 88.14% pass rate, ii) 11 out of 59 passed overall including both maths and English, 18.64% of students. Quality; i) 45 A grades total, giving an average of 0.763, 0.763/3.78 x 100= 20.19%, ii) 2 A grades in maths, 3.39% of students, iii) No A grade in English, 0%. O-LEVEL: quantity; i) 80 out of 83 passed, 96.39% pass rate, ii) 27 out of 83 passed overall including both maths and English, 32.53% of students. Quality; i) 58 A grades total, average of 0.699 A grade, 0.699/3.78 x 100=18.49%, ii) 11 A grades in maths, 13.25% of students, iii) no A grade in English, 0%. A-LEVEL: quantity; all 82 students passed, 100% pass rate. Quality; 27 A grades total, 0.3293 average, 0.3293/0.9647 x 100=34.13%. St Bedes College Ashing came 14th overall in Cameroon. O-LEVEL: quantity; i)111 out of 119 passed, 93.28% pass rate, ii) 45 out of 119 passed overall including both maths and English, 37.82% of students. Quality; i) 108 A grades total, giving an average of 0.908 A grade per student, 0.908/3.78 x 100= 24.02%, ii) 18 A grades in maths, 15.13% of students, iii) no A grade in English, 0%. A-LEVEL: quantity; 113 out of 118 passed, 95.76% pass rate. Quality; 31 A grades total, giving an average of 0.2627 A grade per student, 0.2627/0.9647 x 100= 27.23%. Saker Baptist College Limbe came 15th overall in Cameroon. O-LEVEL: quantity; i) all 54 passed, 100% pass rate, ii) 14 out of 54 passed overall including both maths and English, 25.93% of students. Quality; i) 50 A grades total, giving an average of 0.926 A grade, 0.926/0.9647 x 100=24.50%, ii) 5 A grades in maths, 9.26% of students, iii) no A grade in English, 0%. A-LEVEL: quantity; all 43 passed, 100% pass rate. Quality; 9 A grades total, giving 0.2093 average A grade per student, 0.2093/0.9647 x 100 = 21.70%. O-LEVEL: quantity; i) 57 out of 61 passed, 93.44% pass rate, ii)10 out of 61 passed overall including both maths and English, 16.39% of students. Quality; i) 76 A grades total, giving an average of 1.25 A grades per student, 1.25/3.78 x 100= 33.07%, ii) 7 A grades in maths, 11.48% of students, iii) no A grade in English, 0%. Laval Bilingual College Douala came 17th overall in Cameroon. O-LEVEL: quantity; i) 84 out of 91 passed, 93.33% pass rate, ii) 18 students passed overall including both maths and English, 20% of students. Quality; i) 89 A grades total, giving an average of 0.989 A grade per student, 0.989/3.78 x 100= 26.16%, ii) 4 A grades in maths, 4.44% of students, iii) no A grade in English, 0%. O-LEVEL: quantity; i) 79 out of 83 students passed, 95.18% pass rate, ii) 22 out of 83 students passed overall including both maths and English, 26.51% of students. Quality; i) 40 A grades total, average of 0.482 A grade per student, 0.482/3.78 x 100=12.75%, ii) 4 A grades in maths, 4.82% of students, iii) no A grade in English, 0%. Baptist High School (BHS) Buea came 19th overall in Cameroon. O-LEVEL: quantity; i) 187 out of 254 passed, 73.62% pass rate, ii) 25 out of 254 passed overall including both maths and English, 9.84% of students. Quality; i) 204 A grades total, 0.803 grade A average, 0.803/3.78 x 100= 21.24%, ii) 25 A grades in maths, 9.84% of students, iii) no A grade in English, 0%. The following schools did well at the O-levels but were not included in the overall ranking because they do not yet have an A-level batch that did the A-level exam. 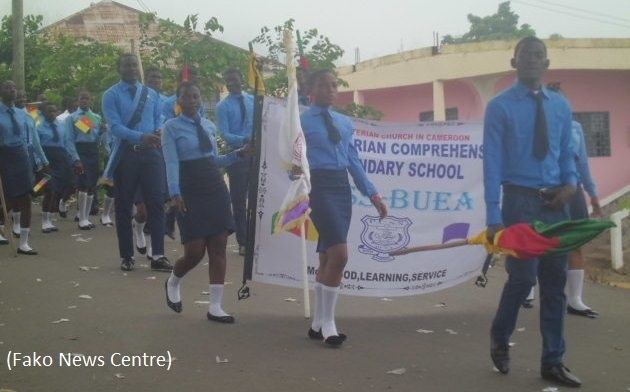 They are: Baptist Secondary School Yaounde, 8th at the O-levels; St Anne’s High School, Limbe, 11th at the O-levels; St Theresa International School, Buea, 15th at the O-levels; PSS Douala, 19th at the O-levels. The following students each had 5A grades at the Advanced level, scoring the maximum 25 points. They are listed by order of merit. 1st) Christine Enowmbi Tambe of Saker Baptist College Limbe (2nd) Nkongyum Prosper Akwo of Bilingual Grammar Sch. Molyko, Buea (3rd) Nelson Nyamnyor of GBHS Tiko (4th)Ngund Tonji Johnathan Willy of GHS Bokwaongo, Buea (5th) Muweh Ansem Tangue of CCAS Kumba (6th)Ngwainbi Durel Ankiambom of GHS Belo (7th) Chokote Yankam Jorim of Amity Int. College Yaounde (8th) Kemguimatio Kenfack Jordan of Holy Infant High Sch. Yaounde (9th) Isaac Ndumbe Jackai II of GBHS Yaounde (10th) Ndamdja Njossu Christian Arthur of GBHS Bafoussam (11th) Fonyuy Boris Lami of GBHS Kumbo (12th) Nzotsa Djoukeng Sophie of GBHS Kumbo (13th) Dounemene Theophile Alban of GBHS Etoug-Ebe (14th) Visas Vikumitsi Tah of Sacred Heart College, Bamenda (15th) Yembu Ngwengi of Sared Heart College Bamenda (16th) Ngohteh Livinus Lopiekeh of CCAST Bambili (17th) Dondji Fogang Wilfrief Tanezick of Sacred Heart College Bamenda (18th) Niba Puissance Osworld of GHS Bafut (19th) Ida Kwam Injei Ngongkum of Our Lady of Lourdes Bamenda (20th) Mouome Ornella Paciolli of Our Lady of Lourdes Bamenda (21st) Akofor Nkecho Thierry Bienvenue of PSS Bafut (22nd) Tcheukounang K. Grace Ruphine S of PSS Bafut (23rd) Mingo Kevin Fuongki of PSS Mankon Bamenda (24th) Inda Daisy-Sophia Kwende of PSS Mankon Bamenda (25th) Afopezi Mbumboh Happy of PSS Mankon Bamenda (26th) Awah Jeremiah Acuro of GBHS Etoug-Ebe (27th) Londe Kevin Kajug of GBHS Atiela (28th) Nkembi Armel Asongu of Seat of Wisdom Fontem (29th)Jervis Chinemerem Ezeukwu of CCAS Kumba (30th) Obi Bessem Flaurantine of CCAS Kumba (31st) Eruck Emmanuel Nfor of CCAS Kumba (32nd) Bakungwe Fokunang Frank of GBPHS Yaounde.